Let us feed the stranger (Matthew 25:34-46), live out our faith out with deeds (James 2:14-26), and love our neighbors "with actions and in truth"(1 John 3:18). There is no greater joy than serving those in need, If you want to be blessed, be a blessing to others. 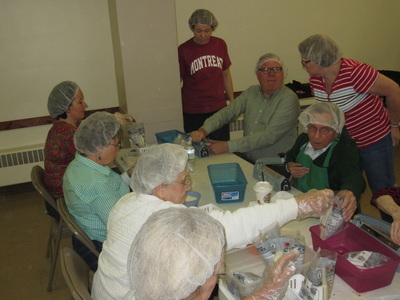 The mission of the Poland Presbyterian Church Mission Committee is to share our time, talents and resources in God’s love by helping those in need in the Mahoning Valley, the state of Ohio, the nation and the world. 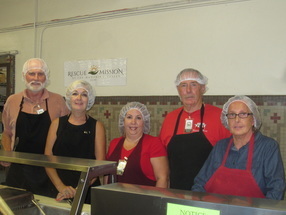 Our outreach efforts provide assistance to: individuals and organizations; needy children and youth; the chemically addicted in recovery; hospice workers; food pantries; mission trips; services to the sick, disabled and elderly; financial assistance to those called to God’s service; and the homeless. The generosity of the church and the participation of the congregation in the mission projects were overwhelming. The Poland Presbyterian Church family is truly involved in serving the greater community. The members of the Mission Committee wish to thank the congregation for supporting us and providing us with the opportunity to serve others. If you would like to help with any of the projects, please contact any member of the mission committee and join one our many mission teams. We can’t do it without you! Local agencies: Salvation Army, Beatitude House, Habitat for Humanity, Hospice of the Valley, Meals on Wheels, Mission of Love, The Needle’s Eye/Southside Ministries, Ohio Valley Teen Challenge, Operation Learning Community Program, Poland Dry Pantry, Poland Interfaith Pantry, Protestant Family Service, Rescue Mission of Mahoning Valley, and Ursuline Sisters HIV/AIDS Ministry, and our very own Helping Hands Hotline. 1. The need TO SERVE those within our congregation. 2. The need FOR SERVICES to those in our church family who may need assistance and are not able to or do not have the resources to hire out help. We offer assistance in a variety of ways such as transportation (to church, appointments or pharmacy), light housekeeping, simple plumbing repairs and changing light bulbs and batteries in smoke alarms. You get the idea, we’ll do our best to fill the need whenever possible. We have close to 30 volunteers waiting to be of service, so let’s put them to work! The Beatitude House serves women and children of Mahoning and Trumbull Counties bound in the cycle of poverty and homelessness. Through their programs, services, counseling, education, love and support, the staff and volunteers help them break that cycle. The services they offer have a strong focus on education, valued as the best way to help one’s self. 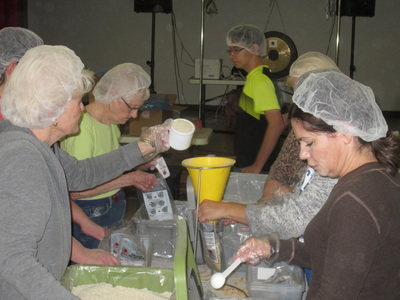 Poland Presbyterian Church has aided the Mahoning County Habitat for Humanity by participating in various fund raisers, making financial contributions, and directly helping volunteers on building sites by providing food and/or labor when needed. Some members of our congregation were active builders at home sites, while others participated in the annual Habitat 5 mile race/2 mile walk in Poland. PPC volunteer bakers provided 35-40 dozen cookies for Habitat’s “cookie table’ at their Blitz Build in Struthers in April 2016. Please call Dave Lang 330-707-0936 or the Habitat volunteer coordinator Colin Penney 330-743-7244 x 302 for more information. Let’s make a difference! Hospice of the Valley provides home care concentrating on comfort-oriented measures for individuals with terminal illnesses. Any terminal illness qualifies for hospice care. Hospice House is part of this service and provides private, home-like rooms for families whose loved ones are in their final days of life. Trained companion volunteers are the heart of the program and provide relief in homes for caretakers, visit patients in nursing and assisted living facilities and provide comfort to patients and their families at Hospice House. 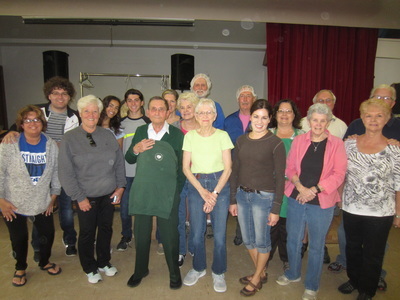 Because many volunteers travel long distances to provide this care and are of limited means, the committee presented the agency with money earmarked for gas cards for these volunteers. Also, the committee has provided money and donations from the congregation to purchase toiletries used by family members staying with their loved one at Hospice House. The Needle’s Eye, a Southside Ministry, continues the great work with the needy on the south side of Youngstown. It is a Christian Counseling Center that provides family and individual counseling services, a drug/alcohol prevention program for young people, support groups for men and women, a mid-week Bible study, a “Princess” program for young ladies and a tutoring program. Our church members provided gifts for 25 children and youth whose names were on the Christmas Angel tree. Currently, The Needle’s Eye has an ongoing penny drive to help purchase new computers. This organization is very grateful for the help that our church provides. Operating Learning Community Program is located at Christ Church on Canfield Road. It is an after-school program that is aimed at improving the educational life of at-risk 3rd & 4th grade students. The program not only provides academic support through tutoring services, but also provides students with opportunities to develop strong supportive relationships and develop life skills through structured activities. Adults and youths from our church tutor weekly during the school year on Tuesdays, Wednesdays, and/or Thursdays. Protestant Family Service Sally Walker Protestant Family Service is an independent agency supported by voluntary contributions and numerous fundraisers, including the October CROP Walk. This agency ministers to the less fortunate in our community by helping them as they adjust to unemployment, financial crises and other life changing events. Workshops focusing on budgeting, saving techniques, time management, healthful meals preparation and resourceful shopping are also offered. Caseworkers on staff monitor the clients. Approximately 30 walkers represented the Poland Presbyterian Church in the Youngstown Area Crop Walk on Sunday, October 14, 2012. Our congregation donated approximately $1,905 to sponsor these walkers. 25% of the money that was raised in Youngstown was divided among Catholic Charities, Fish Samaritan House, and Protestant Family Service. An ongoing fundraiser is the collection of aluminum cans. A collection site is located under the stairwell by the elevator. 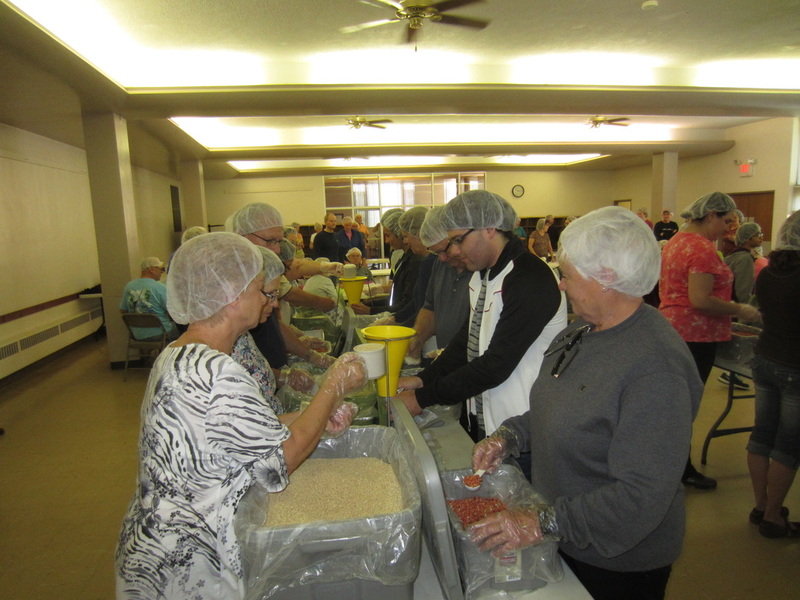 Our congregation continues to support the Poland Interfaith Pantry, a totally non-profit organization run by a board of people from five local churches; Poland Presbyterian, Poland United Methodist, Holy Family Catholic, Kingdom Community Church, and Prince of Peace Lutheran. The Pantry provides bags of groceries and sundry items for needy families in the 44514 zip code area. Each of the five churches offers monetary support and volunteers, as well as donated grocery items. Our youth have shopped for cereal to donate to the Pantry, using funds they raised from Soup/Bake sales. Poland Presbyterian volunteers are responsible for making and serving lunch at the Salvation Army on the third Thursday of each month. PPC volunteers bake many dozens of cookies, cook giant pots of chili, provide applesauce, transport all of it and serve it at lunch time at the Salvation Army facility on Glenwood Avenue in Youngstown. Over one hundred meals are generally served each day to those who might not eat otherwise. Volunteers are always needed for baking cookies, cooking chili and serving lunch. Please contact Sally Walker or a Mission Committee member to volunteer. The Ursuline Sisters HIV/AIDS Ministry is the only provider of programs aimed at meeting the needs of individuals and families infected or affected by HIV/AIDS in a five county area. Services include: a pantry of personal toiletries and household supplies, monthly dinners and social support group, operation of Casa Madre, a site for respite care, pastoral visits to homes and hospitals, children’s programs providing support services such as tutoring, child advocacy, crisis intervention, life skills and recreational activities. Other services are the operation of a Comprehensive Care Center, a pediatric and adult HIV clinic offering HIV health care, counseling, case managements and patient education. Mission of Love Rachel Mullis The Mission of Love is a non-profit, non-political group, all volunteers, who are devoted to helping those in need worldwide. Where there is a need, Kathy Price, the founder, will try to fill it with supplies and/or volunteers. Mission of Love provides humanitarian aid to those in need and focus on providing basic human rights to the children who have none. In spring of 2015, they made their 5th mission to Guatemala to do cleft lip/palate surgeries at Metropolitan Hospital, along with a huge airlift of medical AID, supplies for the children’s hospice which was completed in 2014. “Our own Sieglinde Warren recently joined Kathy Price and Mission of Love on a mission trip to the Pine Ridge reservation in South Dakota to build a new home (see picture) for a homeless grandmother.” Another cleft lip/palate medical mission to Guatemala is planned for November. 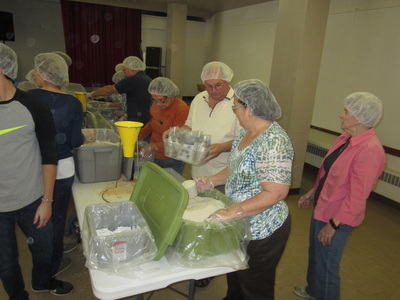 It is truly a life-changing organization for those served and also for the volunteers. If you are interested in additional information about the Mission of Love, or would like to become involved as a volunteer, check out Mission of Love on Facebook and check out the website at http://www.missionoflove.org. ​Ohio Valley Teen Challenge (OVYC) is a residential Christian faith-based support program for men 18 and older. Dedicated to rebuilding those devastated by life controlling addictions, OVTC offers a smoke-free environment of recovery, support, and spiritual formation. 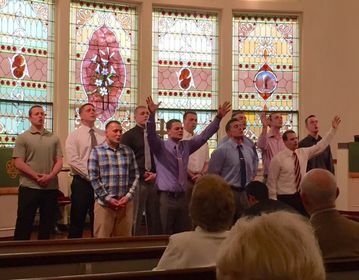 The program inspires self-discipline, responsible decision making, and social and spiritual accountability. Global mission efforts include support of Rev. Elmarie and Rev. Scott Parker, our mission partners through PCUSA. Find out more at www.presbyterianmission.org. 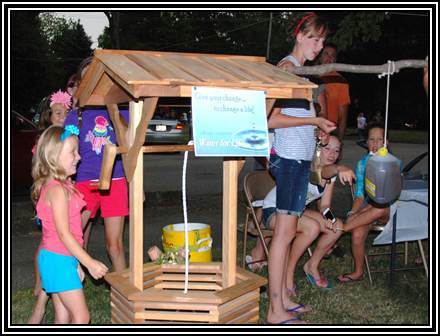 Our Global Mission Project for 2012 was “Water for Life”. Our efforts funded a deep water well in Kenya, Africa. We used our Global Mission Fund along with the generous donations from the congregation and the community. Thanks to all who helped with this project, many now have the gift of clean water! Each year many walkers from PPC participate in the Youngstown Area Crop Walk. Monies raised support Church World Service in its mission of helping impoverished people around the world become more productively self-reliant. For the past several years PPC has won the "Walking Shoe" trophy for having contributed the most walkers to the annual event. In October 2015 PPC once again won the "Walking Shoe" trophy and PPC walkers also raised about 1/4 of the total dollars raised which was also tops. For more information, contact: Sally Walker (330-965-1850). See also www.churchworldservice.org/CROP/index.html. Presbyterian Disaster Assistance enables congregations and mission partners of the Presbyterian Church (U.S.A) to witness to the healing love of Christ through caring for communities adversely affected by crisis and catastrophic events. Via Presbyterian Church USA, this brochure provides an overview of Shared Mission Support and describes how the funds support the ministries of the General Assembly Mission Council. The generosity of the church and the participation of the congregation in the mission projects is overwhelming. The Poland Presbyterian Church family is truly involved in serving the greater community. The members of the Mission Committee wish to thank the congregation for supporting us and providing us with the opportunity to serve others. If you would like to help with any of the projects, please contact any member of the mission committee and join one our many mission teams. We can’t do it without you!